This sweetheart of a bag is shown on Vanessa Hudgens, Kendall Jenner, Jamie Chung, Minka Kelly, and Arianna Grande. 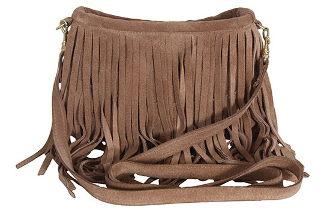 Two layers of fun & flirty JJ fringe make up this adorable suede mini crossbody bag. Detachable 49” strap allows you to attach your flip flops and other festival essentials. 8 inches X 6 inches Double Fringe layers on outside of bag create a total length of 9 ½ inches. In Stock: Taupe, Rust, Plum, Black , Hot Pink & Electric Blue Suede colors. Special Orders are available in any color of Suede or Leather JJ Winters makes! Click on Custom Color and email us with the color you want. You can special order any of our jj winters bags in any color of suede or leather. Please allow approx 3 weeks for custom orders.